alot of changes, please read. Last edited by Pyre; 26-02-2019 at 11:56 AM.. Calling all Division agents, we are preparing to retake Washington. Gather at your assembly points for deployment. Last edited by Pyre; 01-03-2019 at 07:22 AM..
so how was the open beta for those who tried it? feel free to comment below or in the discord. yeah comparisons with anthem aside, we did encounter several delta errors, otherwise it was pretty positive. no load screens and fairly smooth gunplay, though the gun sounds seem much more neutral now. clan will be up for launch. yeah some were already showcased in the end-game scenario of the open beta. specialised gears like crossbow, sniper and grenade gun? division 2 never implement stealth elements. thought can sneak up and take them out 1 by 1. 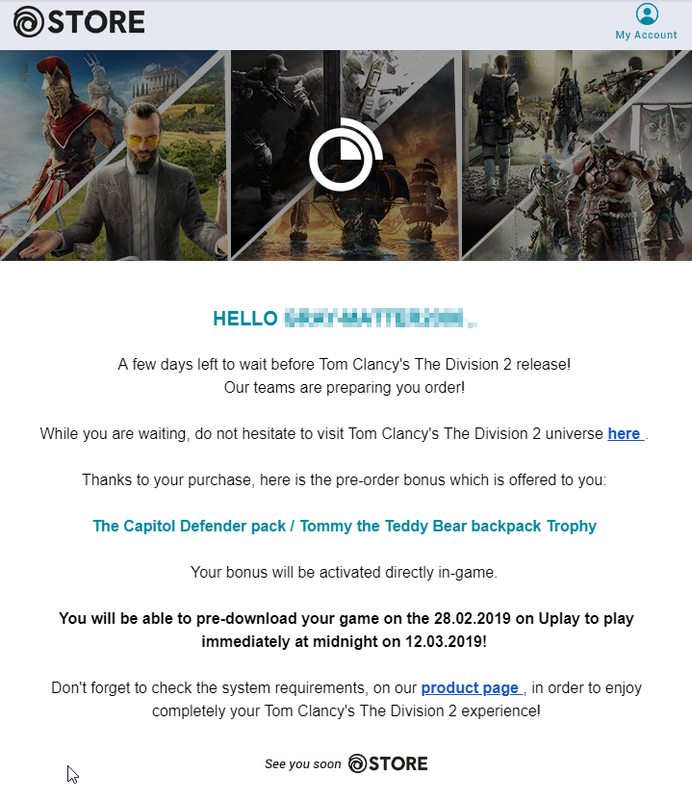 1. press F for few seconds to loot gears in the middle of battle is kinda counter-intuitive.. i prefer immediate loot when press F.
Last edited by Pyre; 05-03-2019 at 07:05 AM..
Looks like there is a free game promotion if you pre order division 2. Any suggestion among the three? note that you won't be able to play the free game until Div 2 launches. this is to prevent ppl from preordering, get the free game, then cancelling their preorder. personally chose Ghost Recon because it still has more to expand this year.